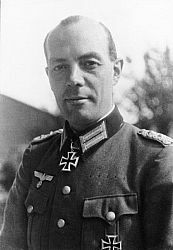 chief of staff, Seventh German Army. (Translated from the German text by Gen. Gersdorff in the presence of Capts. N. B. Sigband and F. Mahin, USFET Historical Officers, Minor paraphrasing and additions were made by the historical officers, all of which were approved by Gen. Gersdorff at a final reading, 12 Dec 45). On 22 Oct 44, the Fifth Pz Army (CG, Gen Manteuffel) was placed in a position on the right flank of Army Group B (CG Gen. Model). 1 This was at approximately the time when the second battle for Aachen had ended: At this time only the command staff of the Fifth Pz Army was present. In broad outline it was believed that the American advance could be halted. However, it was felt that it would not be successful to eliminate the penetrations that had been made on both sides of Aachen nor would it be possible to push the enemy forces west to the boundary of Germany. The city of Aachen was finally lost to the American forces 20 Oct 44. The intelligence reports of the German Army made clear the fact that in the Aachen - Liege sector the purpose of the American drive was the Ruhr industrial area with the cities of Cologne and Dusseldorf as the primary objectives. On the north we felt that the British in a coordinate action would also drive for the Ruhr, sweeping down from the north. The results of consideration on the above point revealed to us that the right flank of the American attack (north) would be just north of Monschau. We felt that the main effort wouId be directed at the Hurtgen - Monschau - Düren road for the purpose of (1) capturing Düren and (2) seizing the Roer Dams. The length of the front of the Seventh Army (from Geilenkirchen to Trier) was too broad to effectively handle the disposition of the tasks at Army level. During the battles east of Aachen more and more mobile troops were brought into the area (Pz Gren units). Also other forces of a highly mobile type were brought forward. This made it necessary to place such forces under an Army that was qualified to direct them. That was the Fifth Pz Army. The Ardennes offensive which had been planned at this time also influenced placing of the Fifth Pz Army in the line of defense. It was believed that this would hide the preparations that were being made for the Dec attack. This line was not satisfactory to the Seventh Army because it ran on an angle to the northeast. It was assumed that when the American attack drove to the east the forces north of the line would withdraw in that direction and those south would withdraw to the east. That would leave an open corner in the direction Düren - Cologne through which the American forces could penetrate. An attempt by the Seventh Army to have the boundary between the two Armies changed to a more satisfactory position was not given favorable consideration by the AGp. In the beginning of November, therefore, the right wing of the Seventh Army was in the Hurtgen Forest engaged in what the Germans termed the third phase of the battle for Aachen. The order of battle of the right flank of the LXXIV Corps (CG, Gen Straube) is as given along the blue lines as indicated on sketch 1. The infantry divisions of the Corps (275 and 89) possessed the faults of being organized hurriedly while holding a front in the Siegfried Line. Many improvisations were necessary and there existed insufficient quantity of materiel for future action. (See interview by Siegfried Line Sub-sectlon with Gen Gersdorff, 28 Nov 44, question 1). The strength of the infantry divisions was complete but the distribution of material among the sub-units was unsatisfactory. The personnel of the units were not soldiers. They were secondary troops end formerly assigned within the ration and had no field experience. The officers and non-commissioned officers were not satisfactory and left much to be desired. The weapons were unsatisfactory and not uniform. The artillery regiments were composed of guns of German, Russian, Italian, and French origin. For some of these foreign guns there was an insufficient supply of ammunition, i.e., the 12.2 Russian howitzer. There were also very few AT weapons, but a sufficient supply of bazookas and panzerfausts. Especially distressing was the personal clothing of the soldiers. This was especially felt when the weather became cold and wet and we incurred a large number of non-battle casualties.